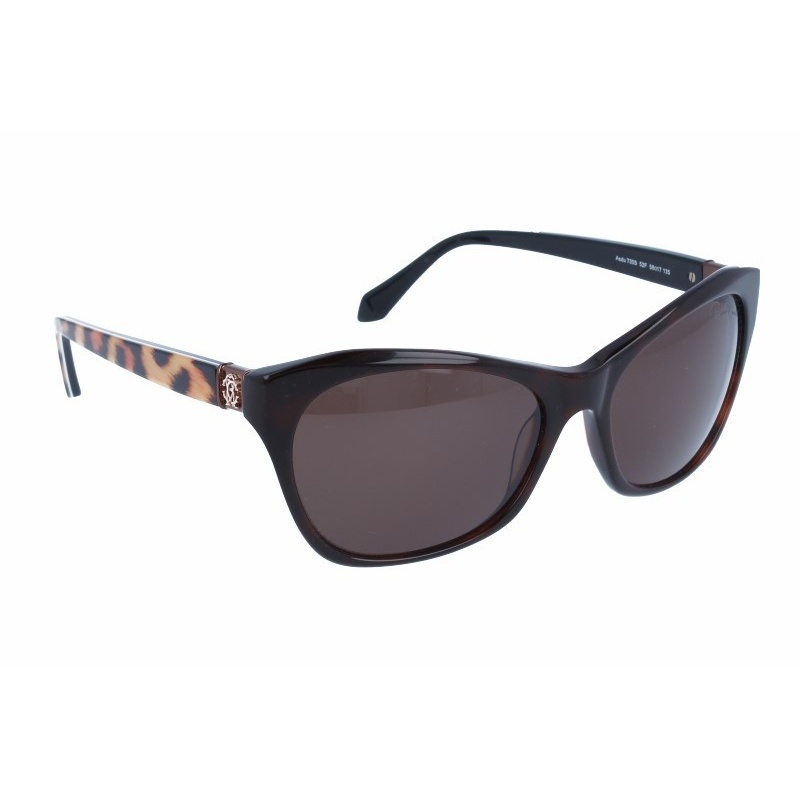 Sunglasses by the brand ROBERTO CAVALLI for Women’s sunglasses, with reference M0006395, with a(n) Modern, Elegant and Female style.Roberto Cavalli Asdu 730 52F 58 17 they have a(n) Full Rim frame made of Acetate / plastic with a(n) Cat Eye shape in Brown colour. Their size is 58mm and their bridge width is 17mm, with a total frame width of 75mm. They have Organic, Brown, Uniform lenses. These glasses are suitable for prescription lenses. These are top of the range glasses from the brand ROBERTO CAVALLI, made of high-quality materials, modern glasses that will give you a look that matches your image. Buy Roberto Cavalli Asdu 730 52F 58 17 sunglasses in an easy and safe way at the best price in our online store. Sunglasses by the brand ROBERTO CAVALLI for Women’s sunglasses,  with reference S0007978, with a(n) Modern, Elegant, Glam and Female style.Roberto Cavalli Casola 1032 69G 56 19 they have a(n) Full Rim frame made of Metal with a(n) Cat Eye shape in Golden colour. Their size is 56mm and their bridge width is 19mm, with a total frame width of 75mm. They have Organic, Gray, Gradient lenses. These glasses are suitable for prescription lenses. These are top of the range glasses from the brand ROBERTO CAVALLI, made of high-quality materials, modern glasses that will give you a look that matches your image. Buy Roberto Cavalli Casola 1032 69G 56 19 sunglasses in an easy and safe way at the best price in our online store. string(146) "Buy Roberto Cavalli Casola 1032 69G 56 19 sunglasses. Modern and elegant model. Original product with fast shipping, quality guarantee and refund." string(37) "ROBERTO CAVALLI CASOLA 1032 69G 56 19"
string(164) "Roberto Cavalli is well-known all over the world due to his outstanding designs and innovative collections. Eyewear is another area in which Cavalli creates trends." Eyewear by the brand ROBERTO CAVALLI, for Prescription glasses for Women, with reference M0011515, with a(n) Modern, Elegant, Glam and Female style.These Roberto Cavalli Buggiano 5023 071 54 18 have a(n) Full Rim frame made of Acetate / plastic with a(n) Cat Eye shape in Brown and Golden colours. Their size is 54mm and their bridge width is 18mm, with a total frame width of 72mm. These glasses are suitable for prescription lenses. These are top of the range glasses from the brand ROBERTO CAVALLI, made of high-quality materials, modern eyewear that will give you a look that matches your image. Buy Roberto Cavalli Buggiano 5023 071 54 18 eyewear in an easy and safe way at the best price in our online store. string(148) "Buy Roberto Cavalli Buggiano 5023 071 54 18 eyeglasses. Modern and elegant model. Original product with fast shipping, quality guarantee and refund." string(214) "roberto cavalli sunglasses 2012,cavalli deals,roberto cavalli sunglasses,sunglasses roberto cavalli 2013,roberto cavalli sunglasses 2012 sunglasses roberto cavalli man,roberto cavalli eyewear collection,sunglasses." string(39) "ROBERTO CAVALLI BUGGIANO 5023 071 54 18"
Eyewear by the brand ROBERTO CAVALLI, for Prescription glasses for Women, with reference M0011487, with a(n) Modern, Elegant, Glam and Female style.These Roberto Cavalli Bisenzio 5021 001 54 17 have a(n) Full Rim frame made of Acetate / plastic with a(n) Cat Eye shape in Black and Silver colours. Their size is 54mm and their bridge width is 17mm, with a total frame width of 71mm. These glasses are suitable for prescription lenses. These are top of the range glasses from the brand ROBERTO CAVALLI, made of high-quality materials, modern eyewear that will give you a look that matches your image. Buy Roberto Cavalli Bisenzio 5021 001 54 17 eyewear in an easy and safe way at the best price in our online store. string(148) "Buy Roberto Cavalli Bisenzio 5021 001 54 17 eyeglasses. Modern and elegant model. Original product with fast shipping, quality guarantee and refund." string(39) "ROBERTO CAVALLI BISENZIO 5021 001 54 17"
Eyewear by the brand ROBERTO CAVALLI, for Prescription glasses for Women, with reference M0011486, with a(n) Modern, Elegant, Glam and Female style.These Roberto Cavalli Barberino 5016 034 54 18 have a(n) Semi Rimless frame made of Metal with a(n) Cat Eye shape in Brown and Bronze colours. Their size is 54mm and their bridge width is 18mm, with a total frame width of 72mm. These glasses are suitable for prescription lenses. These are top of the range glasses from the brand ROBERTO CAVALLI, made of high-quality materials, modern eyewear that will give you a look that matches your image. Buy Roberto Cavalli Barberino 5016 034 54 18 eyewear in an easy and safe way at the best price in our online store. string(149) "Buy Roberto Cavalli Barberino 5016 034 54 18 eyeglasses. Modern and elegant model. Original product with fast shipping, quality guarantee and refund." string(40) "ROBERTO CAVALLI BARBERINO 5016 034 54 18"
Eyewear by the brand ROBERTO CAVALLI, for Prescription glasses for Women, with reference M0007586, with a(n) Modern, Elegant, Glam and Female style.These Roberto Cavalli Grande Soeur 770 001 53 17 have a(n) Full Rim frame made of Acetate / plastic with a(n) Cat Eye shape in Black and Bronze colours. Their size is 53mm and their bridge width is 17mm, with a total frame width of 70mm. These glasses are suitable for prescription lenses. These are top of the range glasses from the brand ROBERTO CAVALLI, made of high-quality materials, modern eyewear that will give you a look that matches your image. Buy Roberto Cavalli Grande Soeur 770 001 53 17 eyewear in an easy and safe way at the best price in our online store. string(151) "Buy Roberto Cavalli Grande Soeur 770 001 53 17 eyeglasses. Modern and elegant model. Original product with fast shipping, quality guarantee and refund." string(42) "ROBERTO CAVALLI GRANDE SOEUR 770 001 53 17"
Sunglasses by the brand ROBERTO CAVALLI for Women’s sunglasses,  with reference S0007800, with a(n) Modern, Elegant, Glam and Female style.Roberto Cavalli Castelfiorentino 1035 01G 56 18 they have a(n) Full Rim frame made of Acetate / plastic with a(n) Square shape in Black, Pink and Golden colours. Their size is 56mm and their bridge width is 18mm, with a total frame width of 74mm. They have Organic, Pink, Gradient lenses. These glasses are suitable for prescription lenses. These are top of the range glasses from the brand ROBERTO CAVALLI, made of high-quality materials, modern glasses that will give you a look that matches your image. Buy Roberto Cavalli Castelfiorentino 1035 01G 56 18 sunglasses in an easy and safe way at the best price in our online store. string(156) "Buy Roberto Cavalli Castelfiorentino 1035 01G 56 18 sunglasses. Modern and elegant model. Original product with fast shipping, quality guarantee and refund." string(47) "ROBERTO CAVALLI CASTELFIORENTINO 1035 01G 56 18"
Sunglasses by the brand ROBERTO CAVALLI for Women’s sunglasses,  with reference S0007798, with a(n) Modern, Elegant, Glam and Female style.Roberto Cavalli Cascina 1030 28G 55 20 they have a(n) Full Rim frame made of Metal with a(n) Cat Eye shape in Golden colour. Their size is 55mm and their bridge width is 20mm, with a total frame width of 75mm. They have Organic, Golden, Mirror, GradientMirror + Gradient lenses. These glasses are suitable for prescription lenses. These are top of the range glasses from the brand ROBERTO CAVALLI, made of high-quality materials, modern glasses that will give you a look that matches your image. Buy Roberto Cavalli Cascina 1030 28G 55 20 sunglasses in an easy and safe way at the best price in our online store. 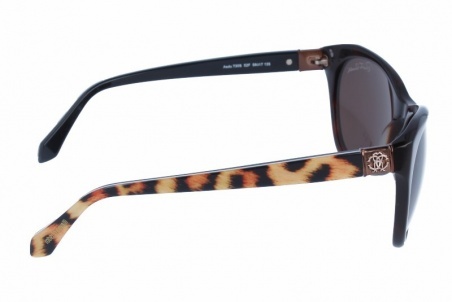 string(147) "Buy Roberto Cavalli Cascina 1030 28G 55 20 sunglasses. Modern and elegant model. Original product with fast shipping, quality guarantee and refund." string(38) "ROBERTO CAVALLI CASCINA 1030 28G 55 20"
Sunglasses by the brand ROBERTO CAVALLI for Women’s sunglasses,  with reference S0007780, with a(n) Modern, Elegant and Female style.Roberto Cavalli Castiglione 1039 50F 56 19 they have a(n) Full Rim frame made of Acetate / plastic with a(n) Cat Eye shape in Brown and Golden colours. Their size is 56mm and their bridge width is 19mm, with a total frame width of 75mm. They have Organic, Brown, Gradient lenses. These glasses are suitable for prescription lenses. These are top of the range glasses from the brand ROBERTO CAVALLI, made of high-quality materials, modern glasses that will give you a look that matches your image. 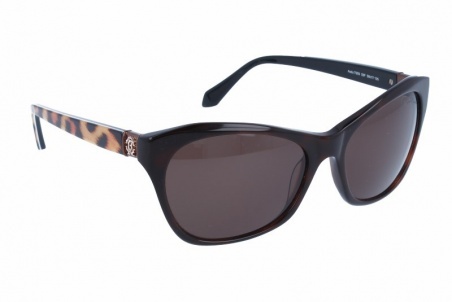 Buy Roberto Cavalli Castiglione 1039 50F 56 19 sunglasses in an easy and safe way at the best price in our online store. string(151) "Buy Roberto Cavalli Castiglione 1039 50F 56 19 sunglasses. Modern and elegant model. Original product with fast shipping, quality guarantee and refund." string(42) "ROBERTO CAVALLI CASTIGLIONE 1039 50F 56 19"